Trey Ivey was introduced to the world of Gospel music when he became the pianist for the ever popular group, Legacy Five, in 2011. Since then he has become a fan favourite with his elegant style and skillful approach to performance. At the age of five, Trey began taking piano lessons, and from the first day it was evident that he was a "natural." "I certainly have a great appreciation for Classical music, especially when it comes to the piano. I enjoy the theory as well as the technical aspects of playing Classical music. I really like trying to incorporate some Classical themes into Southern Gospel. But Southern Gospel is the most 'fun' music I have ever played," states Trey. So it's no surprise when choosing material for his first national release of Instrumental music, he chose classic Southern Gospel favourites such as Mosie Lister's Goodbye World Goodbye, as well as popular Hymns of the church, including How Great Thou Art. Fans of Anthony Burger, Dino and Kim Collingsworth will certainly enjoy this Timeless release. :Trey Ivey was introduced to the world of Gospel music when he became the pianist for the ever popular group, Legacy Five, in 2011. Since then he has become a fan favourite with his elegant style and skillful approach to performance. Anyone who is steeped in rigorous piano playing can be a facile melodist. But few can take the same instrumental pieces and transform them into worship events. Few can bring us into the musical hallways of these notes where we come face to face with the Almighty God, where we experience the cathartic re-telling of the stories of these old familiar hymns again and again. Trey Ivey is one of those exceptions. Ivey is more than just a pianist and "Timeless" is more than just an instrumental project, what you get here is an experience of worship. And if you are looking for an instrumental CD to take us away from the fissures of this world into the presence of the Almighty over well-orchestrated tunes with a top notched engineered sound, "Timeless" is the unmistakable choice. Trey Ivey is the youngest member of Southern Gospel group Legacy Five. Never belied by his youthfulness, Ivey has had been traveling and playing for the Mike LeFevre Quartet and the Old Paths before he joined Legacy Five in March of 2011. Released by StowTown Records,  "Timeless" is Ivey's first foray as a solo artist. 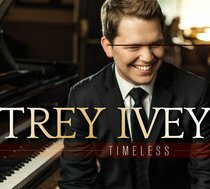 "Timeless," as the titular suggests, finds Ivey putting his magical touches on the old hymns of the church and a few Southern Gospel favorites.